Katy McLaughlin (Alison Lohman) struggles in boarding school and would rather work at the family horse farm. Her father Rob (Tim McGraw) is grooming her older brother Howard (Ryan Kwanten) to take over instead but that's not his dream. She returns home to the ranch with her father, brother, mother Nell (Maria Bello), ranch hands Jack (Danny Pino) and Gus (Dallas Roberts). On a harrowing ride, she is rescued by a wild mustang from a mountain lion. They capture the horse and she calls her "Flicka". Her father balks at the expense and muddying of his purebred horse herd. He entertains an offer for the ranch which makes Howard happy and angers Katy. He sells Flicka to the Rodeo. With the help of Howard and his girlfriend Miranda Koop (Kaylee DeFer), Katy enters the rodeo as a man. 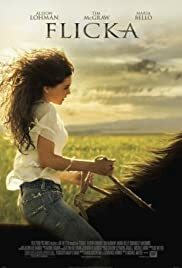 When her father figures out the rouse, she decides to escape with Flicka. Alison is getting a little too old to play a teenager. 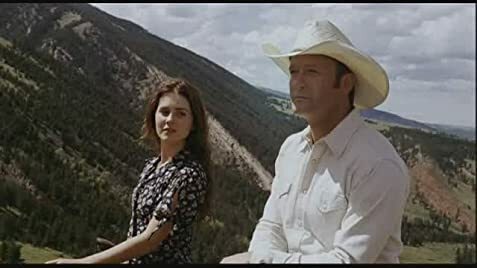 Tim McGraw is not the most imposing presence which his character needs badly. Maria Bello doesn't feel like a country wife. Most of it still works as a simple family movie. There are no real surprises. It's sentimental old fashion. There are a lot of horses and there are beautiful vistas. The drama is old time stuff and the villain is a mountain lion.